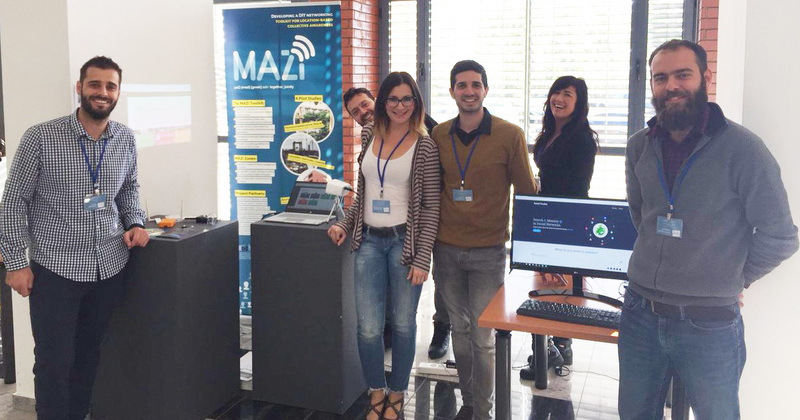 The MAZI project participated in the 4th INSCI Conference with an exhibition booth, in Thessaloniki, Greece, in 22-24 November 2017. The international conference on Internet Science focuses on the contribution and role of Internet science on the current and future multidisciplinary understanding of societies transformations, governance shifts and innovation quests. Its main objective is to allow an open and productive dialogue between all the disciplines which study the Internet as a socio-technical system under any technological or humanistic perspectives. Several workshops on Data Economy and Digital Social Innovation were accommodated at the conference. In the MAZI exhibition booth, attendees had the opportunity to find out more about the MAZI project, its current activities and its future plans. In addition, they had the opportunity to take a look at the recently released v2.1 of the toolkit. The attendees browsed in the applications of the toolkit such as the Guestbook, uploading photos and comments and the Framadate, voting the best demo of the Conference. The statistical data of the Applications as well as the System data were transferred with the new functionality of the Admin “Monitoring” to a remote database.